After the immense destruction and bloodshed suffered in the American Civil War the country turned its attention towards reconstructing the Union. Reconstruction became a time of great uncertainty with a level of fear for the future rivaling the war itself. However, one of the greatest sources of fear was the question of dealing with Confederates and their re-admittance to the Union. In President Johnson's general amnesty proclamation of May of 1865 he decreed that high-ranking Confederate officials, civil servants like postmasters, those whose property was valued above twenty thousand dollars, would not be permitted to re-enter the Union as citizens. So, many of them petitioned for citizenship individually and wrote to President Johnson asking for his pardon. In these petitions, individuals like William A. Lash swore their allegiance in amnesty petitions throughout the fallen Confederacy. "The undersigned citizens" attest to the truth of Mr. Lash's loyalty and hope that the President Johnson would pardon him eventually granted amnesty and William A. Lash was returned to citizenship; however, he only was able enjoy his rights until his death in 1877. (Item 865) After his death, his son Dr. William A. Lash continued to grow and expand the area known as "Lash's Store;" expanding the Lash home and built four houses on Summit Street as the area's population grew and the settlement expanded. His support and direction of the Cape Fear and Yadkin Valley Railroad brought prosperity to the town's citizens and himself. His father's humble beginnings had developed into a major settlement and railroad station for Stokes County. Walnut Cove received its official charter in 1889, but in that same year the Cape Fear and Yadkin Valley Railroad was in unsolvable debt and was sold to the Southern Railway in 1900. (Coleman 2008, 47) Along with the railroad, Dr. Lash lost his and his family's massive fortune and never truly recovered financially before his death in 1908. The town itself still exists today, and one of the original houses on Summit Street that Dr. Lash built still stands to this day. William A. Lash is credited with the settling of Walnut Cove with the aid of his son, Dr. William A. Lash, developed the area known as "Lash's Store" into a prosperous, rural railroad community. William A. Lash's petition promotes the idea of Lash being a good, hard working citizen who had no interest in secession, but whose only crime was being a loyal North Carolinian. 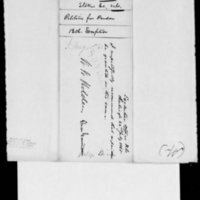 William A. Lash, Amnesty Petition, July 22, 1865, Case Files of Applications from Former Confederates for Presidential Pardons (â€œAmnesty Papersâ€), 1865-67, Records of the Adjutant Generalâ€™s Office, 1780s-1917, Record Group 94, Publication M1003, National Archives, Washington, D.C.
For these reasons, he most respectfully and earnestly prays your Excellency to grant him a pardon; that he hath already taken the oath of Amnesty a copy of which is herewith transmitted; [that?] he prays to be a admitted again to the rights and privileges of American citizenship and for such other relief as his case may require and to your Excellency shall deem prudent. And as a duty bound he will ever pray. The undersigned citizens respectfully state that they are [well] acquainted with Mr. Lash; that the facts in this application are true; that he is a true; good and worthy man and will bring to the United States Government a true and hearty allegiance, and they join earnestly in his prayer and hope your Excellency will pardon him. Cape Fear and Yadkin Valley Railway Company. The Cape Fear and Yadkin Valley Railway: (from Mt. Airy, at the Base of the Blue Ridge, to Wilmington, N.C.): Its Origin, Construction, Connections, and Extensionsâ€¯: Embracing Descriptive and Statistical Notices of Cities, Towns, Villages, and Stations, Industries, Agricultural, Manufacturing and Mineral Resources, Scenery of the Route, Transmontane Extension, &c. Philadelphiaâ€¯: Allen, Lane & Scott, 1889. http://archive.org/details/capefearyadkinva1889cape. Coleman, A. Railroads of North Carolina. Arcadia Pub., 2008. Memoirs of W.W. Holden, 1818-1892. The John Lawson Monographs of the Trinity College Historical Society. vol. 11, The Seeman Printery: Durham NC, 1911. "Town of Walnut Cove: One Hundred Years, 1889-1989." Stokes County Historical Society. n.p., 1989. William A. Lash Service Card: 1864. "Carded Records Showing Military Service of Soldiers Who Fought in Confederate Organizations, compiled 1903-1927, documenting the period 1861 - 1865," Compiled Service Records of Confederate Soldiers Who Served in Organizations from the State of North Carolina, Record Group 109, Publication M270, National Archives, Washington D.C.
William A. Lash: Confederate Papers Relating to Citizens or Business Firms, 1861-65. Confederate Papers Relating to Citizens or Business Firms, compiled 1874-1899, documenting the period 1861 - 1865. 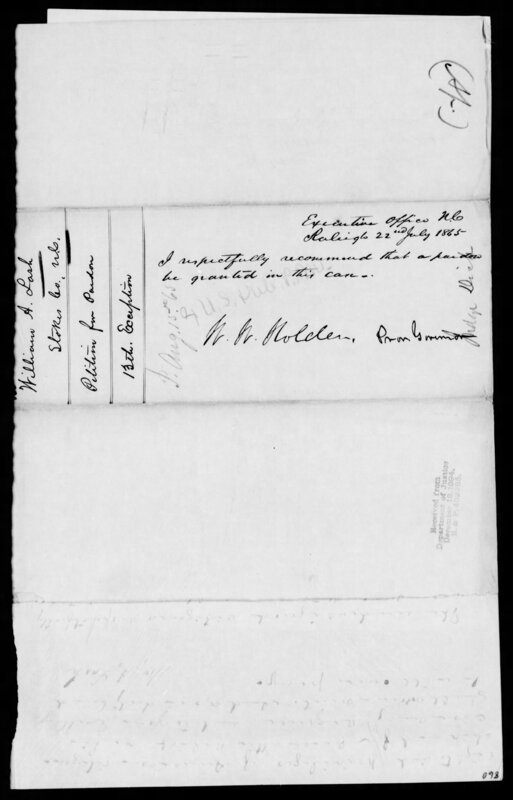 Record Group 109, Publication M346, National Archives, Washington D.C.
William A. Lash , Amnesty Petition of William A. Lash, July 22, 1865, Civil War Era NC, accessed April 24, 2019, https://cwnc.omeka.chass.ncsu.edu/items/show/865.